Don’t waste any more time looking for the perfect waffle batter recipe because this is it! This recipe is super easy and full of delicious waffle flavor. I will teach you how to make waffles from scratch; its fun and super healthy! I’ve tested this amazing waffle batter and it works on many types of waffle irons. From Belgian waffle makers to Mickey Mouse waffle makers, this recipe comes out delicious every time! You can see this batter recipe in use on my various waffle maker video reviews here and on the Waffle Makers Hub YouTube channel. So whip up a batch, get out your favorite waffle maker, and get baking! 1. In a medium bowl, whisk the flour, baking powder, sugar, and salt together. 2. Slowly add the milk, vegetable oil, eggs and vanilla extract into the bowl, whisking constantly so that no lumps form. One of the great things about this from scratch waffle batter recipe is that it’s all natural and healthy. It doesn’t have all the sodium or any of the preservatives found in many pre-made waffle batters. If you do much cooking in the kitchen, you probably will already have most of these ingredients. If you don’t happen to have vanilla extract, you can still make waffles without them, but the vanilla extract helps to give the waffle batter a unique taste. Also, if you don’t have whole milk on hand, two-percent milk will work fine as well. However, I wouldn’t recommend using skim milk in this particular waffle batter recipe. 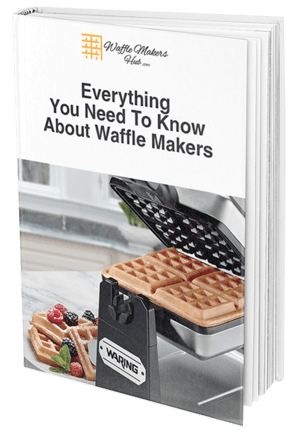 If you need the perfect waffle maker to cook this awesome waffle batter, our Ultimate Buying Guide is the place to start your shopping- all of your important waffle maker questions will be answered! Don’t forget to add maple syrup and some whipped cream before serving! I hope you like it and let me know what you think!